A crowded parish in Makati needs to expand, and acquires a neighboring lot, with the intent of replacing the existing church with a larger structure. 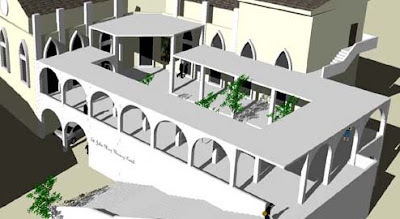 We propose instead to maintain the existing church, which is on the second floor, and provide spill-over space in the form of an open-air plaza and arcade to be built right next to the existing church. 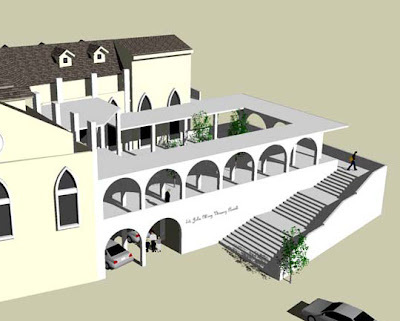 The tall windows of the existing church will be converted into tall doors, opening out to the plaza which will also be on the second floor and which will be approached from street level by a grand flight of steps. The plaza, aside from providing spill-over space during crowded masses, will also serve as an open, tree-planted civic space in a neighborhood that has very little of it. The traditional urban relationship between church and square will be revived here. In the chronology of architectonic form, the rounded arches of the arcade predate the pointed, or quasi-Gothic, arches of the existing church. The grand flight of steps will be visible from Narra Street, and will provide an inviting and celebratory processional approach to the plaza and the church. The Ground Floor will provide 350 square meters of additional space, containing an archetypal network of columns and arches supporting the Plaza above.